Shortbread is one of my favourite biscuits, but I had reservations about trying to make a gluten-free shortbread version because I wasn’t sure if the gluten-free flour would hold up. However, thankfully it turned out perfectly and produces a very tasty and delicate biscuit. Shortbread is a traditional Scottish biscuit and trust me when I say that the Scots are the masters of this particular biscuit. It’s sold at every summer fair or summer show and most families will have their own go-to recipe for shortbread, many of which have been handed down through countless generations. One of the great things about shortbread is that it’s a relatively plain biscuit whose main flavour comes from the butter used to form the dough. 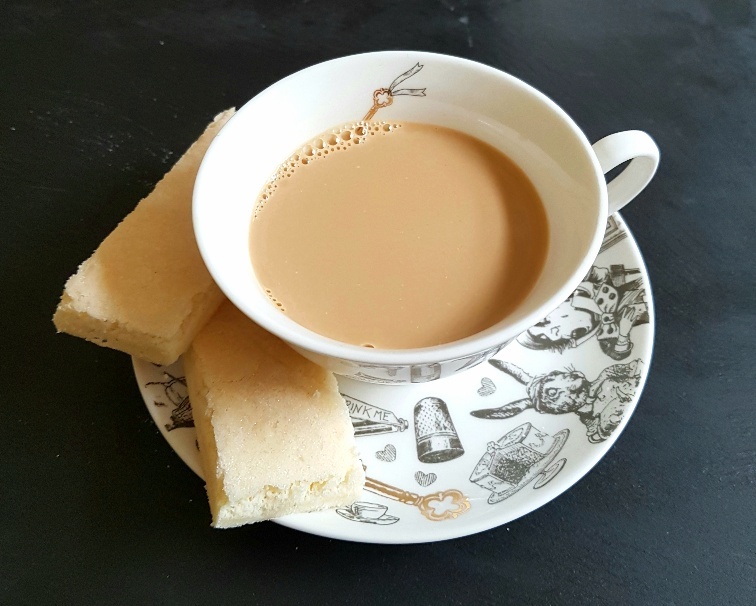 Although a purist would argue that shortbread is meant to be served plain, its very plainness means that you can easily add other flavourings, should you like. I’ve made it before with lemon zest, orange zest, dried ground ginger and cocoa and they all work really well. You can also choose to ice your biscuits or coat them in chocolate, should you wish. If I could offer one final piece of advice it would be to make sure you roll the shortbread dough out thinly (about 1cm thick), so you achieve the right crisp ‘snap’ of the biscuit once it’s baked. 1 piece of shortbread is a low FODMAP portion. Preheat your oven to 200C/180C Fan/400F/Gas mark 6 and line a baking tray with greaseproof paper. Put the dry ingredients into a mixing bowl and add the cubed butter. Rub the butter into the dry ingredients until it looks like fine sand. Add the water and bring the mixture together into a dough. Roll the dough out on a floured surface and cut the dough into fingers and place them on the baking sheet. Bake the shortbread for 12-15 mins until light golden brown. The biscuits are very fragile, so leave them to cool down on the baking tray. Once cold you can take them off and munch them.